When you're boarding a plane, do you usually think to yourself, "There has got to be a better way to do this" as you jockey around other people for overhead bin space? Discovery Channel's Mythbusters experimented with every type of boarding, and the results are efficient, if not very fun. Most airlines board by zones, with assigned seats beginning with First or Business Class, so that the rich folks can sneer and judge the rest of us while sipping their champagne, as we drag our oversized roller bags down the aisle in hopes of finding a coveted storage space. The rest of the boarding typically goes from the back of the aircraft toward the front. Theoretically, this sounds like a good idea, and should minimize blockage by other people in the aisle while boarding. On the show, it took 24 minutes, 29 seconds to board a simulated "average-sized, single-aisle airliner" complete with gate-checked luggage and the last-minute stragglers. Real-world flight attendants assisted in the experiment and boarding process. An even shorter test was the free-for-all boarding, but with assigned seats. This one only took 17 minutes, 15 seconds, but passengers rated this one less-favorable in terms of overall enjoyment. It seems like passengers prefer an orderly boarding process, even if it takes longer. Another popular way to board planes is the "WilMA" method, for window, middle, aisle. 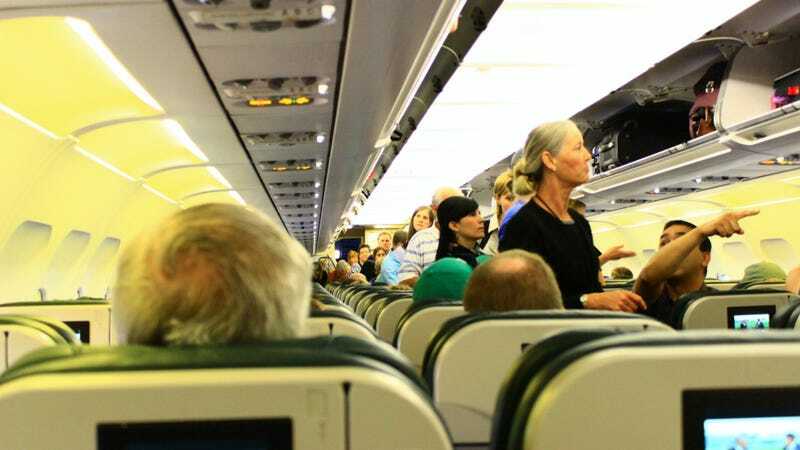 Passengers board the plane at the window seats first, middle seats second, and aisle seats last. Again, this method is also supposed to minimize aisle congestion during the boarding process. The WilMA experiment took only 14 minutes, 55 seconds. Participants gave this method the most favorable score overall. This also proved that the method used by most airlines (back to front) is not the best in terms of efficiency nor customer enjoyment. However, the fastest way to board is the least popular among passengers. In another test, they boarded the plane in free-for-all fashion, without assigned seats, and found it took the least amount of time at 14 minutes, 7 seconds. Passengers gave it the least favorable score in comparison to the other methods tried. Southwest has been using this method since 1971. One of the company's founders, Herb Kelleher said, "Planes only make money in the air" and quick aircraft turnaround times have always been key to Southwest's profitability. Even before moving to its current A-B-C system in 2006, Southwest did its own experiments to make sure non-assigned seats were still the most efficient way to board. So it appears that won't be changing any time soon, but the boarding process is also the least memorable or impactful part of the flight, from a customer's perspective. What's your favorite way to board a plane? If you're like me, you just want to get it over with and up in the air — that is, unless you're sitting up front and want as much time as possible to enjoy your warm nuts and pre-flight drink.